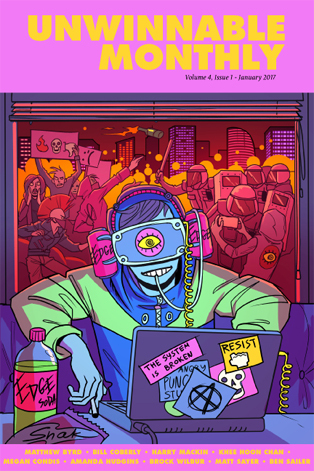 This column is a reprint from Unwinnable Monthly #87, the Rebellion issue. If you like what you see, grab the magazine for less than ten dollars, or subscribe and get all future magazines for half price. 2016 was a year of loss. I know a lot of us endured big political losses, the kind that leaves you dumbfounded and cold. Then, in between the cracks, there are the hundreds of small everyday losses that begin to accumulate and, before you know it, you’re being weighed down. Rooted to the spot and grappling with a loss of confidence, a loss of community. Loss of the self. Yeah, 2016 was a real loser. I asked Twitter if they could think of any games wherein loss was a main narrative thread. Games where the heroes set out to accomplish great things, to defeat the ultimate evil and simply failed. Games where the player just does not win. I got a range of answers. Wander from Shadow of the Colossus, John Marston from Red Dead Redemption. Halo Reach. Mafia 2. L.A. Noire, among others. What I saw from my rather relaxed poll was that games have plenty of protagonists that fail on a personal level. When you start looking for games that deal with large groups of people, or movements failing, examples become harder to find. This undoubtedly stems from big modern games being very player-centric. Too much so. I personally think games’ tendency to want to do everything in their power to please the player has too tight a rein on their development. This would explain why fail states, or negative endings seem to be more common in games that allow multiple endings. Mass Effect 2, Dying Light: The Following and Heavy Rain got touted in this regard. Failure here is an option, but not the optimal result. It is the result of the player doing something wrong (often intentionally as they have criteria that are notoriously hard to hit in a regular playthrough), instead of the failure being written in as the game’s intent. So big AAA games tend to shy away from failure, and the grander the scale the harder it is to see. By the end of the search, we had come back with four solid examples. Killzone 2 and Resistance 2 which are both big sequels to exclusive franchises, meaning Sony is definitely the most nihilistic of the platform holders. Metal Gear Solid 2, which, paradoxically, has one of the happiest endings to a Metal Gear Solid game, even though everyone loses. Finally, we have Wolfenstein: The New Order. That’s okay. What I like about Wolfenstein is, even in the face of overwhelming odds that dictate you cannot win, people still fight and they come together to do it. As long as you surround yourself with good people, it’s okay to fail. That’s probably a sentiment games could start taking more to heart. More importantly, it’s something I’m going to try to take on board going forward. Try as you might, things just might not work out. That isn’t an excuse to not try. When the world pushes back we could probably bear it a bit better together. Remember you don’t need to suffer to make great art. So read, write, sing, watch, make a twine game, a collage, whatever you want. Communicate and share. Let’s face it down together.